It is quite a thrill to see and hear a piece with which one has some little familiarity, performed by another orchestra, on another stage, by a foreign troupe. First, the orchestra. Although some will doubtless beg to disagree, I find Loevenskjold’s score a very fine piece of ballet music, an admirable expression of the choreographer’s innermost idea. Whereas the Danes’ orchestra is more like the Berlin in sound, with a vigorous double-bass and violoncello section, whereas the French like to hear the relationship between the woodwinds and the higher strings, the English ear tends towards a lighter string texture, the brasses being brought more strongly forward. This way of hearing, related, in part I suppose, to the language each country speaks, impels the conductor to underline varying dramatic moments; the tension will not be identical in occurrence, to what one would experience at Denmark. It is fascinating, and I would have liked to see the ballet several times more at Covent Garden, to register this more fully. M. Kobborg is but 32 years of age, and the Sylphide is no divertissement, but an elusive and tricky work for one’s first attempt as maître de ballet. Nor is Covent Garden Little-Blitherington-on-Bloop. But here is a production that holds the boards. If I had to choose between M. Huebbe’s new production at Copenhagen, where there is little in the text that has been changed relative to Hans Brenaa’s production, and M. Kobborg’s, where cuts in the music have been opened, a somewhat iffy pas de six added in Act I, and a pas de deux in Act II, oddly enough I would prefer that of M. Kobborg, because he is in no hurry. He is not in a hurry with the mime. M. Kobborg has looked to it that everyone on stage know why and what they are saying with those "funny gestures". That said, the actual execution of the "funny gestures" leaves something to be desired. Dancers today have been brought up on the tacky, naturalist style of acting in cinema and television; they slump into a "couch potato" stance when not actually dancing, and carry that over to the mime. It is unclassical, lacking in beauty. However, make themselves understood, they do. M. Kobborg has looked at the mime afresh, so, for example, in the final scene he has "spelled out" the mime of Anna, James’ mother, between grief over a lost son, and joy that Effie has found another. In M. Huebbe’s production, this "unimportant side aspect" did indeed get swept aside, along with much else. 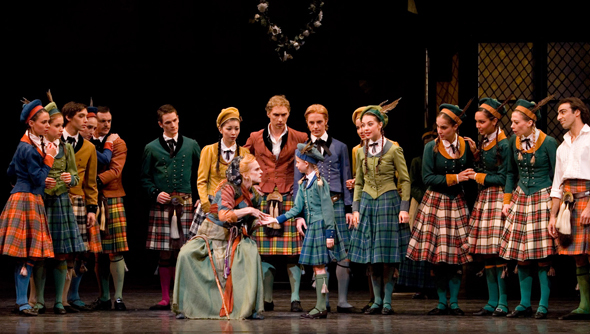 The Covent Garden corps de ballet has shewn itself responsive to Kobborg’s instruction, and they work as a corps, not as a group of restive rivals. When they come out to celebrate James’ wedding, it is a celebration, they are dancing for Effie and James. Or, darting in and out of the wings to tease James in Act II, the corps of Sylphs DO tease him, they do make eye contact, they reach out to him - "catch as catch can !" However, there was no épaulement in the Scots reel. What is beautiful in the reel is, as the artists turn, to see the dissymmetric shift in the shoulder-line, leading the dance forward. Without épaulement, the energy is purely rhythmic, and thus one-dimensional. Incidentally, in Act One’s celebratory vein, were it not better to return to Bournonville’s original idea ? That the two soli be danced, not by James and Gurn, but by the villagers as a gift to the bride ? This not only affords a pair of lads in the corps a chance to do something, it prevents the soli from degenerating into the display of bravura dancing it has now become. During the weekend of October 28th and 29th, three casts alternated: Marquez/Samodurov, an un-announced appearance by Sarah Lamb (replacing Tamara Rojo) with Robert Pennefeather; and Cojocaru/Putrov. Owing to back-to-back appointments on the Saturday afternoon, we were unable to see Miss Lamb, the pupil of Tatiana Legat. Those who did see all three casts report that as artist and as technician, Miss Lamb resides in an elevated domain - a soft, unstrained neck and shoulder line, a powerful centre, deep épaulement, a firmly-held foot, extraordinary ballon and batterie, a soundless weightless jump. The Marquez/Samodurov cast was most unremarkable, constrained both by technical obstacles, and a dry imagination. As for Cojocaru/Putrov, M. Putrov is an excellent dancer, his work is serious, thorough, very brilliant (he is one of the few Russian-trained dancers who has ballon, and can really beat), but regrettably still somewhat mechnical. Whether it were quite James, or the excellent Ivan Putrov, remained somewhat unclear. The lovely Cojocaru is seriously hampered by what Kiev technique has done to the body. She cannot jump because the ligaments are used up and her hip joint is spoilt; she cannot move through a position because the body itself is so "deconstructed" that she lacks the control, and so remains with but one jet&eacute viz., the 180 degree photo-finish, and two arabesques, viz., the 180 degree photo-finish, that everywhere now passes for arabesque pench&eacutee, and a Balanchine-type Click. Her body and arms are all over the place, weakly, and the wrists broken. It is pretty, and certainly, Cojocaru is a loveable person, her mind and emotions are behind everything she does, but having the "right attitude" does not suffice to make a great classical art form. The body must be strong, and firmly held, to do what Miss Lamb calls "holding the forms", or what the Russians call plastique. The essence of classical dancing lies in the plastique. That is why it is marginally better to be strong, than to be flexible. The dance moves from and through one form to the next, but we must be strong, to hold the form. Otherwise, the dancer may see the concept in his mind, but it will never become intelligible to the public as an affect, as the shade or shadow of an idea. We cannot allow huge forces to tear through the body, shaking us like a deer in the jaws of a lion, hyper-extending the wrists and elbows as though by whiplash injury. On the Saturday, the role of Madge was taken by Sorella Engelund, a very detailed and refined interpretation that is best seen at fairly close range. Perhaps this may sound odd, but I marginally feel nevertheless that such roles - Carabosse, Madge, and so on - should be played by a man. It is not only the question of bodily size and strength in the supernatural being. The acting and dancing of the man will always have a greater intensity, it carries further, and it is not surrounded by a delicate aura. That is why Sheakespeare too is often better acted by all-male casts: the emotions are so tumultuous, that one must have the voice and breath, the stamina and energy of a man, to carry it throughout the theatre and over an entire evening without becoming shrill or hoarse. Finally, in composing his Sylphide, Bournonville penned a diatribe against the Romantic movement, that, like Beethoven and Schumann, he saw as a perverse excuse to wallow in feeling, at the expense of responsibility whether that be political or personal. It is odd that, at counter-purpose to Bournonville’s explicit intent, the Covent Garden programme notes refer to this as a "Romantic" ballet. No ! He has used, deceptively, the idiom and imagery of that era, the better to carry what would otherwise be a very unpalatable truth.